For the past few weeks, social media posts on Reddit and Bitcoin Talk have seen posts regarding users trying to buy old bitcoin wallets from 2008 to 2010. Needless to say, the community has pointed out one possible person, Craig Wright. The adverts in question are offering between $4,000 and $5,000 for old Bitcoin wallets that mined over 300 BTC between 2008 and 2010. The strange classified ads may seem odd, but several reasons have been brought to light as to why someone would want to purchase these ancient wallets. 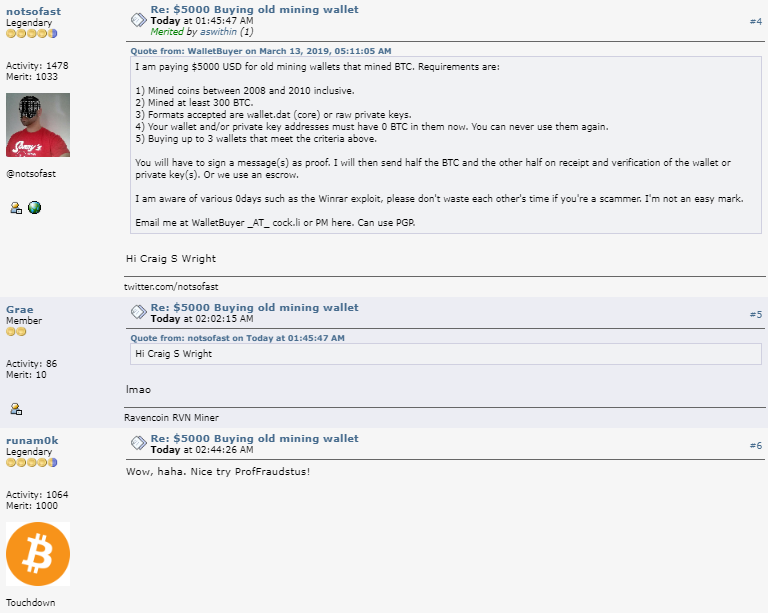 One of the main reasons is that Craig Wright, the self-proclaimed inventor of BTC, otherwise known as Faketoshi, is looking to acquire early BTC address in an attempt to prove he was heavily involved in bitcoin back in 2008 up to 2010. While most of the community sentiment backs the assumption that it could be Craig Wright, other users on Reddit admit that it could be users who are trying to mitigate paying larger tax on crypto assets due to the fact that they have been holding them for 10 years. Although most of the tax laws resulting in long term capital holding only require investors to hold between one-to-three years. The only other reason to purchase old wallets would be to sign the address, which perhaps could give credence to Faketoshi looking to purchase early-day mining addresses. Either way, if you have an old bitcoin mining wallet and you need some extra cash to BTFD, speak to Craig Wright. Do you think it is Craigh Wright trying to buy the old wallets?